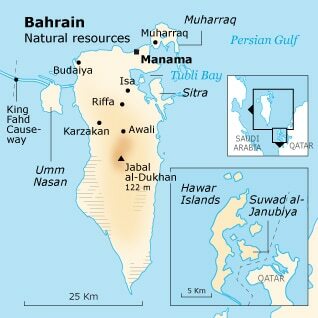 As an island state, Bahrain has fewer contested borders than its neighbours. Historically, Iran claimed suzerainty over Bahrain, based upon its control of the islands until their ouster by the Al Khalifa. Another claim of suzerainty brought Bahrain into conflict with Qatar. 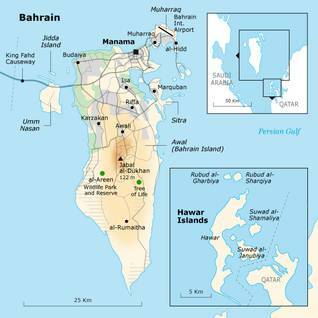 Bahrain continued to claim al-Zubara and the nearby islands, based on its historical control of these areas. In 1991 Qatar took the matter to the International Court of Justice, which resolved the dispute in 2001, by giving Bahrain the most significant islands but granting Qatar rights to the entire Qatari Peninsula. 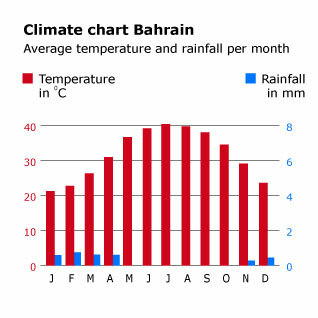 Like the entire southern Gulf coast, Bahrain has extremely hot and humid summers. Between June and September, temperatures reach 52 °C. In winter, from November through March, temperatures are milder, generally between 10 °C and 21 °C. Annual rainfall is low, only 8-10 centimetres, and the period from June to November is virtually rainless. The country has a large variety of flora and fauna, due to its ecological diversity. Suwad al-Janubiya, one of the smaller islands of the Hawar group (adjacent to the Qatari coast), is home to the world’s largest breeding colony of Socotra cormorants. The Hawar Islands also have a spectacular resident flamingo population. In the central desert area of Bahrain Island only small, mostly nocturnal, animals have survived local hunting pressures. Bahrain’s plants and trees continue to be used for the preparation of herbal medicines by the local population. Tubli Bay, south of the capital, Manama, has a unique ecosystem, including black mangrove and the tough sea-grass Halodule uninervis, on which the seriously endangered dugong feeds. Bahrain’s oil and gas reserves are relatively modest and dwindling. Water is obtained from artesian wells and, increasingly (about 70 percent in 2006), from desalination plants. With the decline in groundwater resources, Bahrain’s farming area has also declined rapidly since the 1960s. According to FAO statistics, the total cultivated area in 2005 was 6,000 hectares, of which roughly 95 percent was permanently irrigated. According to government figures from 2006, the area under vegetable crops (mostly tomatoes, okra, and pumpkins) totalled 660 hectares. Apart from vegetables and fruit (bananas, lemons, and limes) for human consumption, alfalfa is grown for animal fodder. The country’s date plantations produce about 15,000 metric tonnes of dates per year. Livestock products include the meat of goats, sheep, and poultry, and cow’s milk. The total fishing catch in 2006 was 15,594 metric tonnes. The natural environment of Bahrain is threatened by industrialization, land reclamation, urban and commercial development, and oil leakages. The precious ecosystems of the officially protected areas of Tubli Bay and the Hawar Islands are under serious strains, and a substantial number of indigenous animals (reem gazelle, terrapin, sooty falcon, dugong) are endangered. 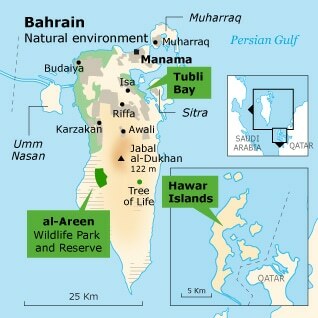 Bahrain’s only national park, the al-Areen Wildlife Park and Reserve, was established in 1976. It is a conservation area for species indigenous to the Middle East and North Africa, including about 240 species of birds and mammals, some of them in enclosures (in the Park), others free-roaming (in the landscaped Reserve). Among them is a herd of the endangered Arabian oryx, reem gazelles, Houbara bustards, pelicans, and flamingos. Even al-Areen is now facing overdevelopment, with plans for a water-park, a resort, and residential complexes. With about two hundred cars per square kilometre, Bahrain, not surprisingly, ranks sixth highest among the world’s CO2-polluters per capita. This results from the country’s small population and prosperity. 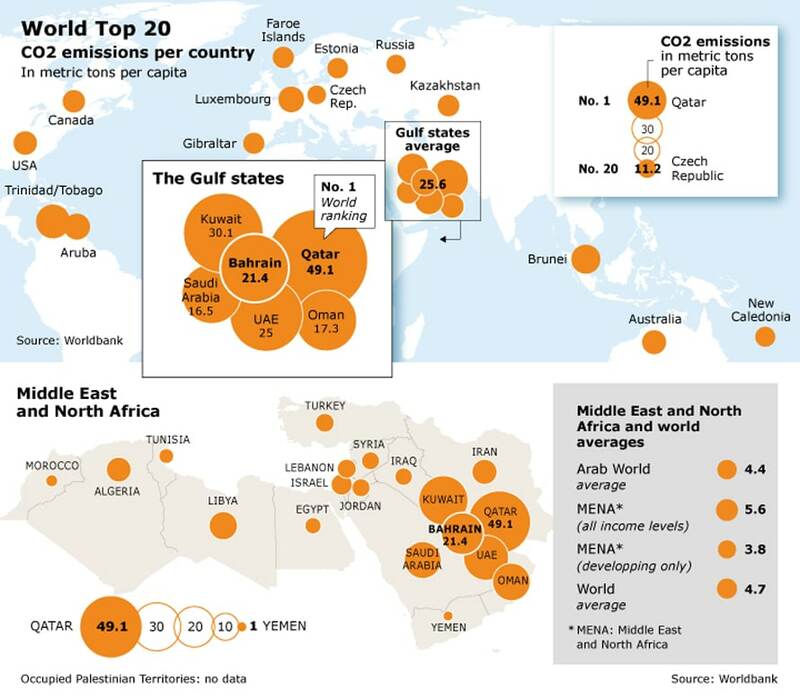 According to the World Bank, Bahrain’s CO2 emissions (21.4 tonnes per capita, in 2008) are similar to those of Luxembourg (21.5 tpc). Neighbouring countries score higher, however: Qatar, 49.1 tpc; Kuwait, 30.1 tpc; UAE, 25.0 tpc. A Formula I racetrack was built in 2004. These racing cars will add modestly to the country’s CO2 emissions. 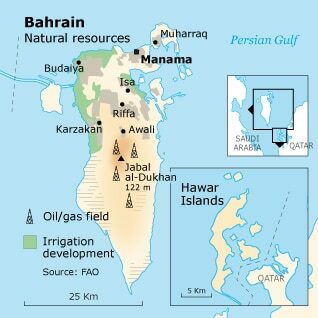 To add to the country’s already severe environmental problems, Bahrain’s ancient underground aquifers are in danger of depletion and are degraded by salt-water intrusion resulting from excessive pumping of groundwater.